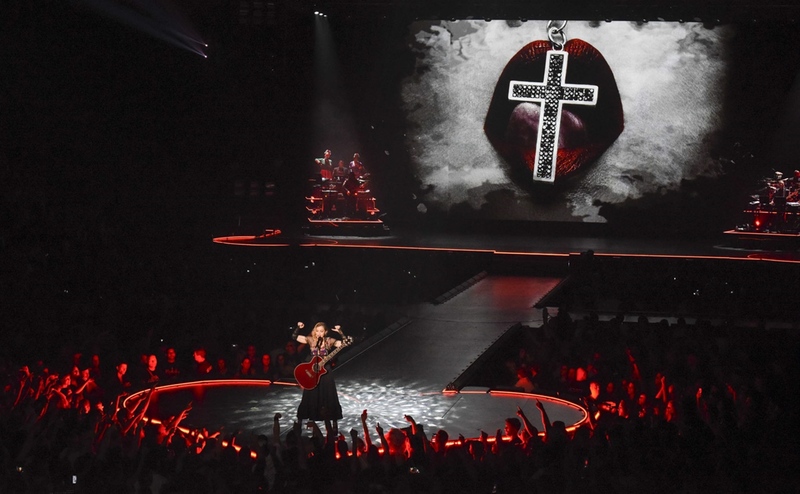 Designweek’s Tom Bank sat down with Stufish and talked in more detail about their collaboration with Madonna for the Rebel Heart Tour. 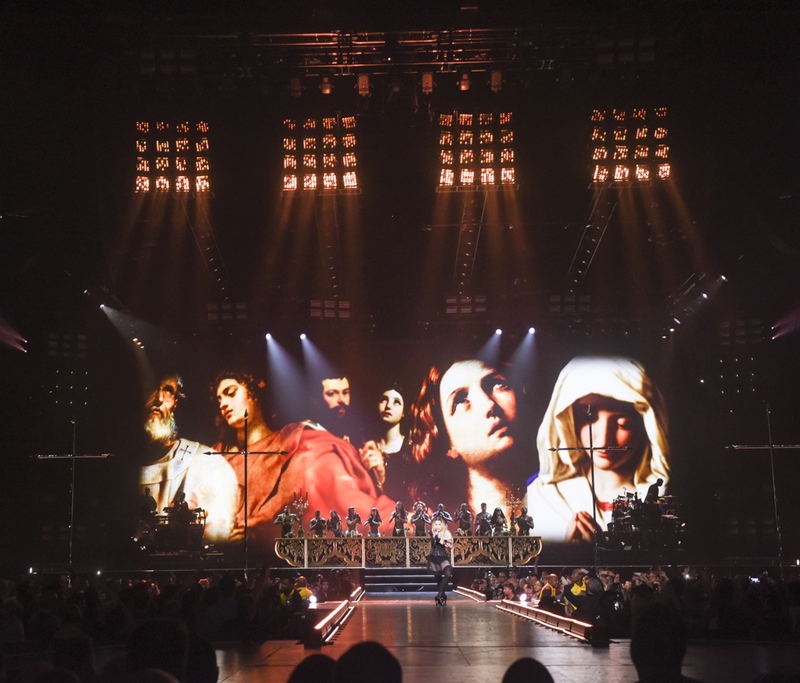 Madonna even made a joke about it last night when she said that hearts and penises are clearly very linked and this is God’s way of setting her life in motion. We build a whole mock set before the real thing. The staircase is probably one of the most complicated things we’ve ever built. We mocked up the staircase in one piece, out of steel. 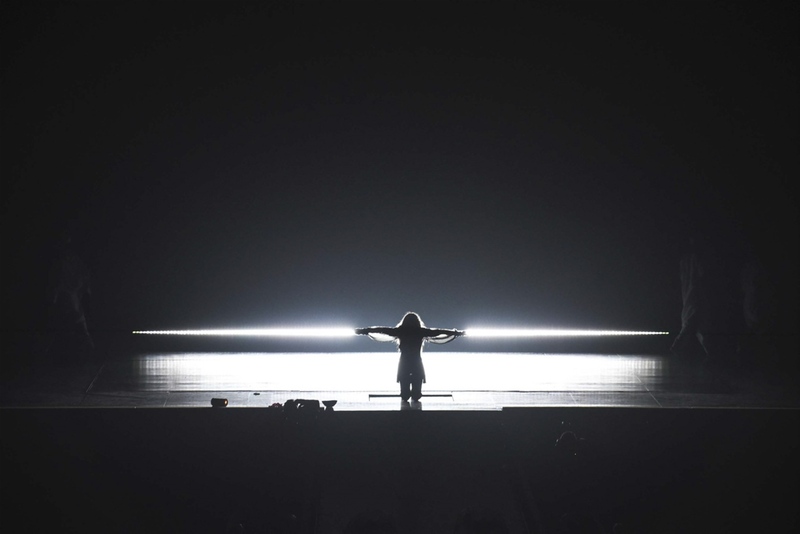 You should never use steel, because it’s too heavy and you should never use one piece, because it’s too big, but Madonna got used to how sturdy it was in rehearsals over six weeks. When the aluminium one came it wasn’t as sturdy, so she said, ‘We’ll take the steel one on tour.’ It’s a good example that you should always build the real prop straight away if you can, or you’ll never get away from it otherwise. Without sounding negative, every single prop in this show had a problem and went back to prop fabricators. 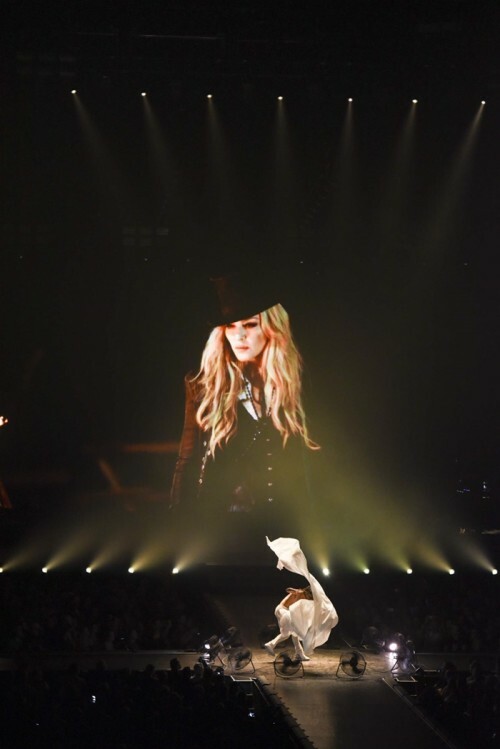 Between it being built as a mock and the real thing, for whatever reason – if it was me, or the vendor or Madonna changing her mind – there was always a new problem to fix. This was not an easy build by any stretch. There is a scene near the beginning of the show where Chinese hand fans are used…. 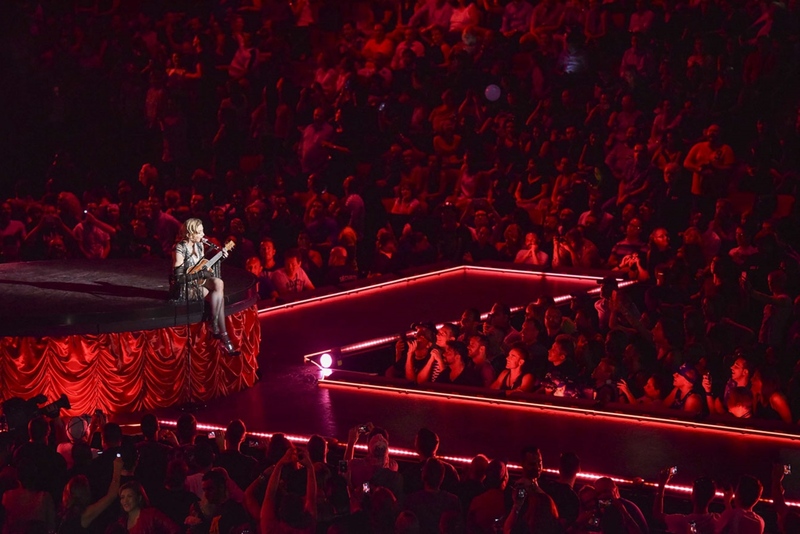 The Rebel Heart Tour has provided Stufish a chance to once again work on a spectacular show by Madonna, where the production value and attention to detail is some of the highest in rock and roll/pop entertainment. The stage and set design for the 2012 MDNA tour were incredible, and still, Rebel Heart tops that. 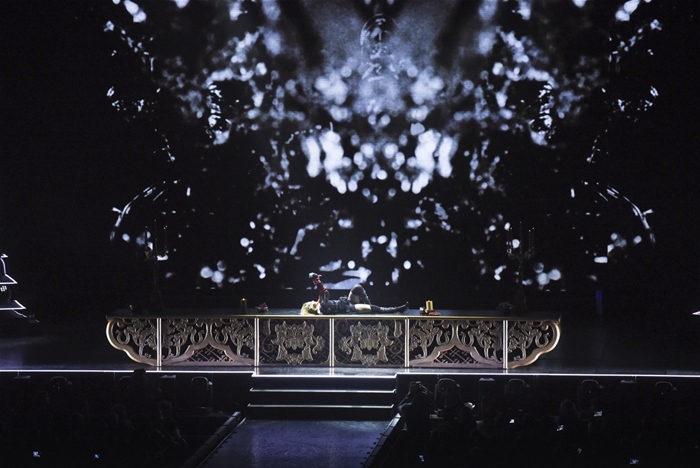 Stufish have designed elaborate and bespoke statement props for one of the world’s most iconic performers of all time, as well as an intimate experience for the audience to witness one of the greatest shows of all time. Tons of pictures & videos from all the Rebel Heart Tour shows HERE! 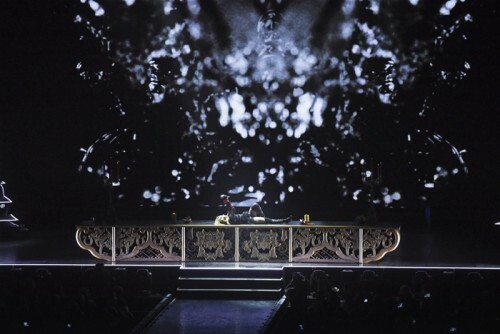 The show is a seamless transition between staging, choreography, scenic props, performers, musicians, lighting and video. All departments work together to create a bold and individual performance that constantly changes throughout the show. The stage shape is derived from a hybrid of an arrow, a cross and a heart. A long narrow catwalk leading from the main stage divides the audience down the centre and extends deep in to the arena culminating into the heart shaped stage. Half way down the catwalk is the horizontal cross stage spanning almost the entire width of the arena. 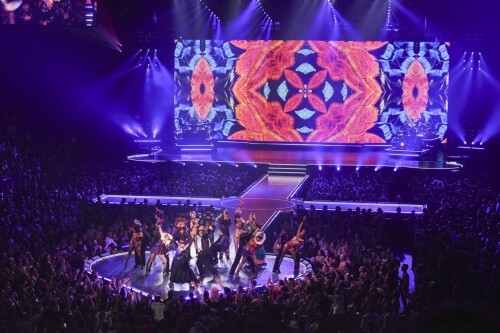 This stage formation allows Madonna and her dancers to reach more audience, closer up and more intimately than ever before. The main kinetic feature of the stage is a complex “machine”, which allows for various acrobatic and scenic moments throughout the show. The machine is a 28ft wide x 16ft high video screen deck that assumes numerous positions; It can be flush with the main stage as flooring, act as an 8ft raised platform, a vertical wall that can tilt from flat to ninety degrees in 30 seconds and be an angled wall that performers can ride. There are specialized bungee points built in to the top edge of the machine which let performers flip, tumble, run and roll up and down the ramp, hang from and free run on the wall in any of these positions. Still looking for Rebel Heart Tour tickets? Get them HERE!